It's been a long time coming, but finally, the US and NATO are going to intervene in Darfur. It's too late for almost a quarter of a million people, but at least now we'll get off our arses and help. 10. Cheap gasoline. Saved our budgetary arses, it did. 9. Johnson Space Center. If you love science, love astronomy, love the space program, Houston has a special place in your nostalgia. I just wish I'd had time to go see it. 8. Tex-Mex. I prefer Baja cuisine myself, but I have to admit to enjoying Tex-Mex, especially those fried dessert things... what were they called? And I wonder why I need to lose weight. 7. Chik Fil-A (sp?). OK, so it's found other places, but that's where I was introduced to it. 6. Shiner Bock. Damned good beer. I still favor local brews, but Oregonians pride themselves on appreciating good beer as much as making it, and so I have to give it its props. It sure as hell beats Sam Adams five different ways from Sunday. 5. Whattaburger. Mmmmmmm...... best damned restaurant hamberger I've ever had. Puts In-N-Out or my local favorite, Burgerville, to shame (notice a trend here?). 4. Texans know how to throw a party. Seriously, Scott, that was the best spread I've ever seen. Brisket, chicken, sausage... I'm starting to drool. 3. It's home to one of the best friends you could ever ask for. albeit from a different angle and a greater distance, it's a gorgeous sight each day. 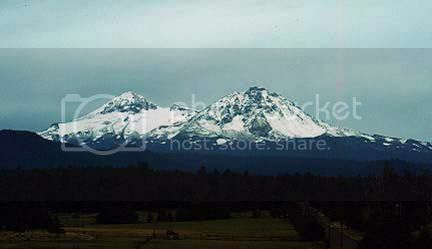 Those are the Three Sisters, and they're among the most likely volcanoes in the central Cascades to reactivate during my lifetime.